The Aputumpu Festival is a musical showcase featuring more than two dozen rising Brooklyn-based bands comprising the backbone of the burgeoning Brooklyn music scene. For New York City, Aputumpu is a celebration of the best new talent in the city, an amalgam of creative and artistic forces which seem to be as much a part of the air as the weather. In a city overflowing with musical talent, these bands rise above with distinctive sounds and unforgettable performances. The Brooklyn music-centric Aputumpu Festival (started by the video blog of the same name) is back and the three-day fest happens at five venues in Brooklyn and Manhattan, beginning tonight (3/28) at Cameo for a night of indie electronics, featuring live sets from Dickpic, Psychic Twin, Vensaire, Silent Drape Runners, Stranger Cat, St Lenox and Brother Tiger, with a DJ set by Chrome Canyon. 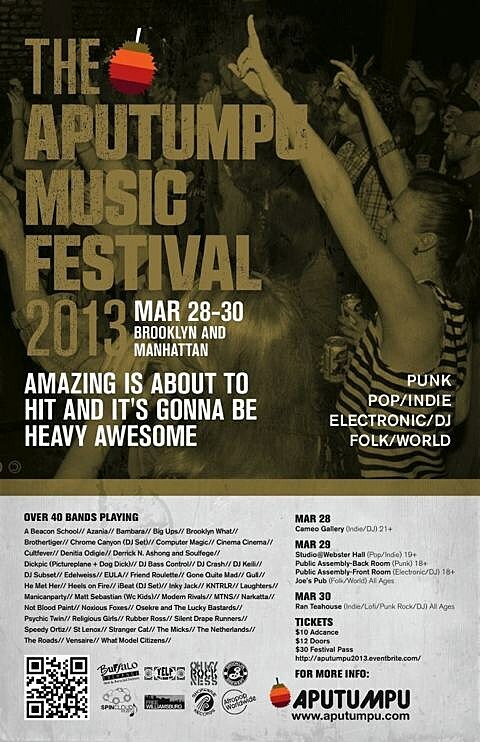 Friday (3/29) is the big night for Aputumpu with a folk/world show at Joe’s Pub with Azania, Derrick N. Ashong & Soulfege and more; Computer Magic, Friend Roulette and more at Studio at Webster Hall; and both stages at Public Assembly, with EDM in the front (Rubber Ross, iBeat, more), and punk in the back room (KNTRLR, Religious Girls, Cinema Cinema, more). The festival closes out on Saturday (3/30) at Ran Tea House, with Eula, Speedy Ortiz, Bambara and more. Aputumpu Festival passes are $30 and tickets to individual shows are $10. Passes and tickest to Cameo, Public Assembly and Ran Tea House can be purchased here, Joe’s Pub tickets are here and Studio @ Webster Hall here.